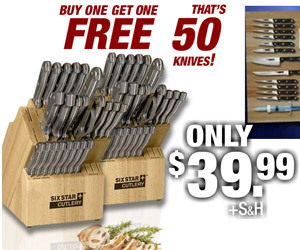 All The Knives You’ll Ever Need. Buy One Get One FREE! That’s 50 Knives! Get a FREE Solid Flavor Injector with each Set of Knives Use the solid flavor injector to inject nuts, herbs, olives, pineapple chunks, fresh or dried fruits, hot peppers, vegetable pieces, candy, chocolate chips (and just about anything else you can think of) into hams, leg of lambs, pork loin, roasts, turkey, breasts, cupcakes, cakes, and pastries.